Kairn participates in a radio contest focused on scavenging from an ark crash in a nearby forest. There, her scavenging enrages the Hunters, a group that lives in harmony with forest ark landings and who hate scavengers, seeing them as enemies to their way of life. Kairn winds up involved in the schemes of the High Temple as they use parts from her robot to create a beacon as they attempt to contact the Ark Beings who launched the Arks. The High Temple seeks knowledge and understanding from the Ark Beings, while the Hunters fear that bad things will happen if the High Temple’s beacon is successful. The palette and use of light in this graphic novel’s artwork is fantastic! 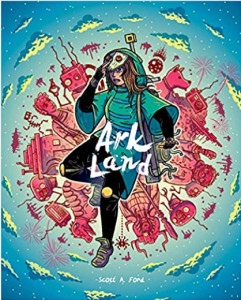 The author fleshes out the world’s details using radio broadcasts about the upcoming Ark Day Festival to fill in backstory without stopping the action of the plotline – simultaneously filling in the reader about what’s happening while still moving the action forward. 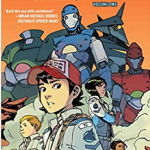 The main character’s narration comes in the form of talking with her dog and robot companions, and, in this way, the reader can listen in to follow along with the plot. The diverse cast is refreshing, as is Kairn, the tough female protagonist who plays retro video games, builds robots, and takes care of herself. She is reminiscent of Rey from recent Star Wars movies and is a character readers will root for. The world Ford builds is vibrant, colorful, and interesting, with weird and wonderful creatures, a rich mythology around the Arks, and towns and landscapes readers will want to continue exploring beyond this volume. 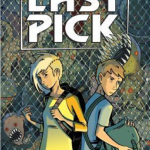 Hand this graphic novel to Star Wars fans, and those who enjoyed Zita the Space Girl and Space Battle Lunchtime. Imamura has spent his high school days ignored by his classmates because of his intimidating looks, and has accepted the fact that he will live his life alone without any friends and without participating in anything. If he can just make it through the graduation ceremony, he’ll finally be free from the snide comments of his classmates, but after falling down a set of stairs, he wakes up three years in the past on his first day of school. 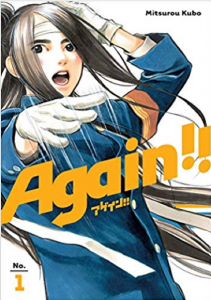 Imamura decides that this time he will do things differently and leave his mark on the school, but he never expected to get caught up in helping the difficult and stubborn Ouendan Club President save the club for future generations. Again!! is a high school drama full of rivalries, friendship, regrets, and flawed yet relatable characters. While Imamura is an intimidating loner who behaves strangely at times, he does feel deeply, and he openly cries whenever he is accepted by his classmates despite priding himself on not needing other people. 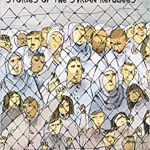 The illustrations are intense and realistic, offering a refreshing change from stereotypical manga illustrations while also elevating both the drama and humor for readers. An accessible read for those unfamiliar with manga while still bringing something new for those who are comfortable with the format, Again!! will resonate with anyone who ever wanted a chance to be a better version of themselves. Caldecott Honor-winner Mariko Tamaki takes on the Supergirl origin story in this fresh take on the Girl of Steel. Kara Zor-el is a high school student with a secret. She does most things like any other teenager—hanging out with her best friends Dolly and Jen, running for the track team, eating too much cereal. But she’s also got super powers. When her adoptive parents found her years ago in a mysterious pod, they took Kara in and raised her as their own. They made her understand how important it was to hide her powers. But when an earthquake strikes her high school’s track meet putting her friends in danger, Kara must decide what’s more important— keeping her secret, or keeping her friends safe. 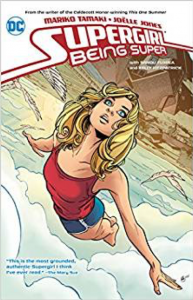 With a renewed interest in the character due to the CW television series, Supergirl was certainly in need of a new origin story. Tamaki’s take will please fans both new and old with a slightly different yet familiar interpretation of the story. The addition of some new characters—Kara’s friends Dolly and Jen—really help to make this story its’ own while not altering the preconceived universe. 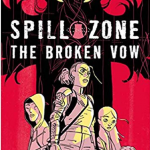 The strong development of diverse characters rises above tokenism making this a standout title for those looking to develop an inclusive collection. The rebooted artwork is fantastic as well. The tension in some moments, especially during the earthquake scene, is palpable due in part to the skillful illustrations of Joelle Jones. 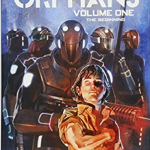 Recommended for new and old fans of the Girl of Steel. Readers of Patsy Walker aka Hellcat, Mockingbird, and She Hulk will also devour this story like Supergirl with a bowl of cereal.